Owning an RV provides a great opportunity to get out of town and enjoy some time on the road exploring. You can take a spontaneous mini break at short notice, or spend weeks planning a road trip that takes you cross states. No matter the length of your break, taking some of the creature comforts with you will make your trip more enjoyable. Hot water is one of those, and luckily there are a number of products on the market to help you with this. The Suburban water heater is one such example that will easily fit into your mobile home. Read on for more information about this camper trailer heater that provides instant hot water on demand. First and foremost, this unit lives up to the high standards that we have come to expect from the brand. This is why one of the main things to note about it, is its strong, quality build. Like other products made by the manufacturer, the Suburban hot water heater is built to last and should serve your vehicle well over time. Size-wise, it is pretty compact and won’t take up too much room inside your camper. It weighs in at 35 pounds, has dimensions of 35 x 19 x 18 inches, and for a 6 gallon water heater, is surprisingly easy to install and use. Not only will it fit anywhere, but it will also blend in everywhere. It has a polar white colored door which is designed to look at home on any recreational vehicle. One of the extremely useful features of this unit is its ability to switch between electric and liquid propane (LP) gas power sources. Because you can choose how to power the appliance, you will avoid emergency situations such as when the gas unexpectedly runs out or you have no electrical connection. With an impressive 12,000 BTUH input and recovery rate of 10,2 gallons per hour, the Suburban SW6DE is actually the fastest in the industry at the moment. Furthermore, when you have a higher demand for heating water, the gas and electric inputs can be used simultaneously for higher recovery. So if you are looking for a long hot water flow with more hot water cycles, then this is a great option. Showering and cleaning your camper will be that much enjoyable with this product installed. As we mentioned, this Suburban water heater can be powered by either LP gas or electricity, or both at the same time. The combination option is a wonderful feature and has great benefits. Not only will it allow you to save on propane, but it will also give you an alternative option should you run out while on the road with nowhere to restock. Recovery time, ie the continued flow of heated water is highest when using the gas and electric inputs together. However, even if just powered by electricity, the heater will give you a satisfying result. If you have been let down in the past or are looking to speed up hot water flow in your RV, then it could be time to consider the Suburban combination propane gas and electric water heater for installation. When away from home and out in your motor vehicle, keeping your water hot is always appreciated. This is one of the big advantages when it comes to the Suburban water heater. Having a fast recovery time is a key factor to these sorts of appliances, and this particular one is possibly the best in its category. The impressive recovery rate of 10,2 gallons per hour has earned the SW6DE its place among the fastest on the market to do this. What this really means for you is a better flow of hot water and less cool water cycles interrupting it. As this is an RV propane water heater that can also run off electricity, there is more power to recover it. If both sources of power are used together, the recovery time is at its absolute best. There may be many different aspects involved when choosing a new water heater for your vehicle. However, there is really just one main feature that matters – the tank size and how much water it can heat and store. This model will keep an adequate six gallons of water hot and ready for your use. When living the mobile life, this volume will go a long way without taking up too much space inside your camper. Considering its impressive recovery time and heating volume, getting enough hot water from this unit should not be a concern. Many people may struggle to find the right heater that will fit into their vehicle. Luckily, this brand knows how to cater to a large audience of RV users. This unit sits with dimensions of 25 x 19 x 18 inches – a perfect standard fit for most recreational vehicles. The sizes and features of this Suburban water heater easily match the requirements of the bulk of vehicle models out there. With the easily adaptable RV water heater anode that prevents corrosion, convenient size, as well as weight, the SW6DE suits almost every space. So no matter what kind of size or power requirements you face, Suburban heaters have a solution. We have already established that this machine has some great power options available. However, that’s not all there is to this combination gas and electric model. They also have an additional 1,440 watt element for that extra boost. This allows for a far greater bonus recovery time when being used at campsites; 6 gallons per hour to be exact. When buying a new heater unit there is always an extra task that we often forget about – installing it. Unfortunately, it is often the case that MacGyver-like skills are required to get the thing set and into place. Fortunately, this Suburban 6 gallon water heater takes this stress away. With its standard sizing, reasonable weight, and minimal bits and pieces, this unit fits in easily. 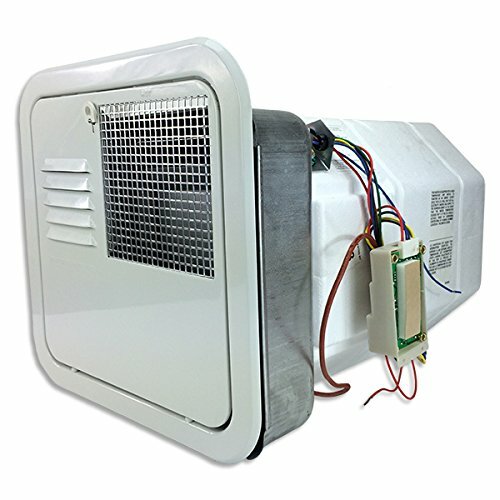 In fact, many people have praised this particular heater for how fast and easy it was to install into their RV. This model is also very compatible with most mobile homes, so it should not take much effort to get this baby heating up your water. Looking for help with Installation? When it comes to water heaters for RV camper trailers, Suburban really is a brand that delivers. Quality, life span, and intelligent design are all aspects associated with the manufacturer and brand ideals. Furthermore, because it is so well known, finding Suburban RV water heater parts is easy. If anything were to go wrong with this device, the repairs and maintenance will be a breeze to manage. Electric and propane heaters each have their own advantages. Depending on your particular RV situation, you might lean more towards using one over the other. For example, if you often run other appliances in your vehicle from one power source, this will likely impact your decision. It is important to save on resources (and costs) where possible, so finding a smart solution for powering your water heater is important. To put the two sources into perspective, there are 26,85 kilowatt hours of electric energy in one gallon of propane. Fortunately, this Suburban water heater offers you either propane, electric, or combination varieties. Being able to switch between the two power sources or using them together is one of the biggest bonuses to this unit. The switch allows you to track and control your vehicle’s energy usage more efficiently. This will help you to save money as well as resources over the long run. It also gives you a useful backup energy source if a problem arises. In short, this is the perfect product to get the job done right. The suburban RV hot water heater ticks all the right boxes of what you would want in this kind of appliance. It is backed by an industry expert, is easy to install, affordable, and made to last. Then once it is installed you will be able to enjoy the highly useful energy source combinations which give this unit an enviable edge. The recovery time is amazing, the door looks good, and your 6 gallons of hot water will come easier than ever. We highly recommend this unit to any RV users out there.